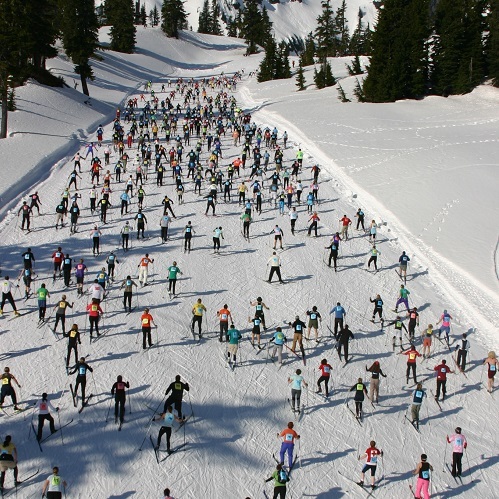 Spectator Viewing AreasLooking for the best viewing areas of the Ski to Sea Race? Get up to the Mt. Baker Ski Area by 7AM on Race Day, as the Mt. Baker Highway closes at 7:15AM at Glacier, and no cars will be allowed up after that. Parking will be tight and cars will be escorted down in small groups beginning about 9:30AM and the highway will re-open when the last runner is finished around 11AM. Best viewing areas are near the upper lodge where the start and handoff occur. Start will be at 7:30AM. Dress for cool weather. Same as above with regard to getting to the ski area. The first handoff will occur at about 8:05AM. Standing on the snow you can see the exchange closely, watch the skiers climb north face in the distance and watch the skiers race down the hill to the pavement looking for their runner. The first downhill skiers should finish about 8:25AM. While there are several turnoffs below the ski area on the Mt. Baker Highway where you can watch runners, the Sheriff’s office does not allow any cars on or near the highway so you will need to park in a designated parking area. Please note that the highway does not re-open until around 11AM so you are trapped there until the last runner finishes. The best place to watch runners is where the race starts at the upper lodge of the Mt. Baker Ski area or at the DOT snow sheds where the run to road bike exchange happens. Parking is also at a premium here. 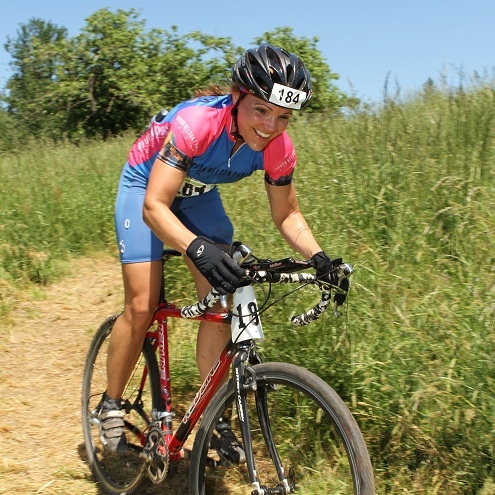 While there are many turnoffs between the DOT exchange area and Everson, parking along the road is not allowed because it may be hazardous to riders if you open a car door as a biker races by. Please park off the highway in the uphill part of the highway as the right lane and shoulder in the downhill lane is filled with speeding bikers. There are good places to watch in Glacier, Kendall, Nooksack and the exchange area at Riverside Park in Everson. South Pass Road will be closed this year to race fans to make it safer for bikers so if you want to follow a team you will need to drive to Nugent’s Corner and then north on Highway 9 to get to Everson. All of the canoes will be staged along the bank of the river and one canoeist will need to get the chip from the road biker and then run across uneven ground to the river before he can begin the paddle down river. One of the most hazardous parts of the river is the whirlpool near the north end of Noon Road but there is very little parking. Other good vantage points are at the Hannegan and Guide Meridian crossings, in Ferndale at one of the parks overlooking the river or at the exchange area in Hovander Park where parking is plentiful. 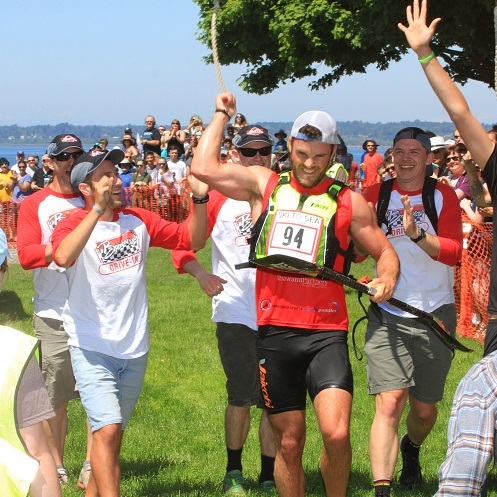 The finish is fun because the exhausted canoeists must carry their canoe across the finish line before they hand the chip to the mountain biker. At Hovander Park in Ferndale there is loads of parking and this is a great spot to watch the start of the cyclocross bike leg. Along the course there are some good viewing spots behind the Ferndale Haggen, in the grassy field on the east side of Haggen, at the Ferndale Redi-mix cement plant on Smith & Labounty, along Marine Drive between Smith Gardens and the first bridge, in Squalicum Creek Park and in the approach near Zuanich Park at Squalicum Harbor. Please remember to not block the bike lanes as racers are planning to race there. Zuanich Park at Squalicum Harbor is a great place to watch the start and see nearly 500 colorful kayaks staged for the start. If you are in a boat you need to stay away from the course and not make a wake. From the shore you can see the kayaks from Boulevard Park or go to Marine Park and watch the finish. It is great fun to watch a kayaker hop out of his kayak and try to run up the hill to the finish after his legs haven fallen asleep. I any case the finish line at the foot of Harris Avenue in Fairhaven is where everyone gathers after the race. There will be vendors, loads of racers and fun for the kids. There is a WTA shuttle running between WWU and Fairhaven so you do not have to try to find a parking spot near Fairhaven and there is a pay lot across from the Cruise Terminal on Harris. We hope you enjoy watching our local athletes compete in the Ski to Sea Race.